Simon & Schuster, 9780743229586, 368pp. From National Book Award-finalist Jean Thompson comes a compelling, highly charged novel about a family ruled by the weather, the drastic changes that hit their atmosphere, and a midwestern town where chaos doesn't reign -- it pours. Something big is headed for Springfield, Illinois, a place where weather of all kinds -- climatic, emotional, and even metaphysical -- tends to come in extremes. It is the summer of 1999, and through the long months of blazing heat and fearsome tempests, a quirky quartet of locals will try to ride out the stormy season, each in their own way. Uncle Harvey believes he is the embodiment of the Weather Channel's "Local Forecast," even though all meteorological evidence points to the contrary. His niece, Josie, is fixed with a different predicament -- she's young and pretty, with nowhere to go except into deep trouble. Her mother, Elaine, lives under a fa ade of cheerful efficiency, desperately masking a far more urgent quest. And all of them are caught in the path of the loner Rolando -- a human cyclone from the West, fueled by a boundless rage and determined to make Springfield the focal point of his wrath. Detonates a whole fireworks of happy endings -- flares of hope and success so exuberant that the book almost seems to require a warning label. Wide Blue Yonder offers precisely the kind of beautifully crafted, intelligent, imaginative writing that serious readers crave....Each sentence deserves to be appreciated. 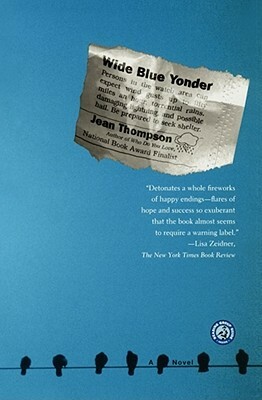 Wide Blue Yonder reaffirms Thompson's stature as one of our most lucid and insightful writers.